Georginio Wijnaldum expects Premier League title hopefuls Liverpool to have a difficult game against Manchester United as Ole Gunnar Solskjaer's side are enjoying "a new flow". United are unbeaten in the Premier League since Solskjaer took temporary charge as the replacement for Jose Mourinho in December, winning eight games and drawing the other. That run has seen United climb into the top four as they seek Champions League qualification, while victory at Old Trafford on Sunday could also help them derail Liverpool's title bid. Liverpool, meanwhile, are enduring a stickier spell, having won only three of their past eight games in all competitions amid a defensive injury crisis. Wijnaldum is under no illusions about the size of the challenge facing Jurgen Klopp's side. 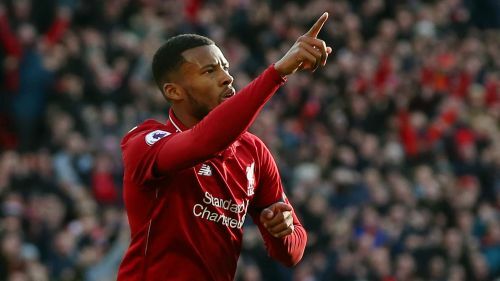 "I think it is going to be a real big change," Wijnaldum told reporters, referring to Liverpool's 3-1 defeat of United at Anfield in December, which proved to be Mourinho's final match in charge. "Since the new manager came in there is a new flow, they played good games and have won a lot and that is building confidence in the team. "It's also a home game for them so they will have a lot of confidence as they don't have the problems they had before. It is going to be a difficult game but I'm looking forward to it." Liverpool were held to a goalless draw by Bayern Munich in the first leg of their Champions League last-16 clash on Tuesday, a result the Netherlands international feels leaves the tie in the balance. "A bad result for them? Why? I think it is a good result for both," Wijnaldum said. "The only thing is if we go there and score a goal they have to score two. One of the advantages is that they will play at home. "I think a lot of teams when they come to Anfield and they play a draw they think it is a good result. I don't think it is a bad result for them. But neither is it for us. "They will also analyse us and know where we are strong. I don't think they will play really open because they know we are good on the counter-attack, but they also know we score goals with good football and create chances. "It's difficult to say how the game is going to go but it is going to be a tough one that's for sure."